We were quite intrigued when told about Frank & Beans out at Majura Park. Our impression of the area was based on the idea of giant warehouses such as Costco, and office blocks clinging to the runway. According to our source, someone was taking on the whole taco/hotdog reinvention, although rather than in the city centre, it was located in the Legoland near the airport. 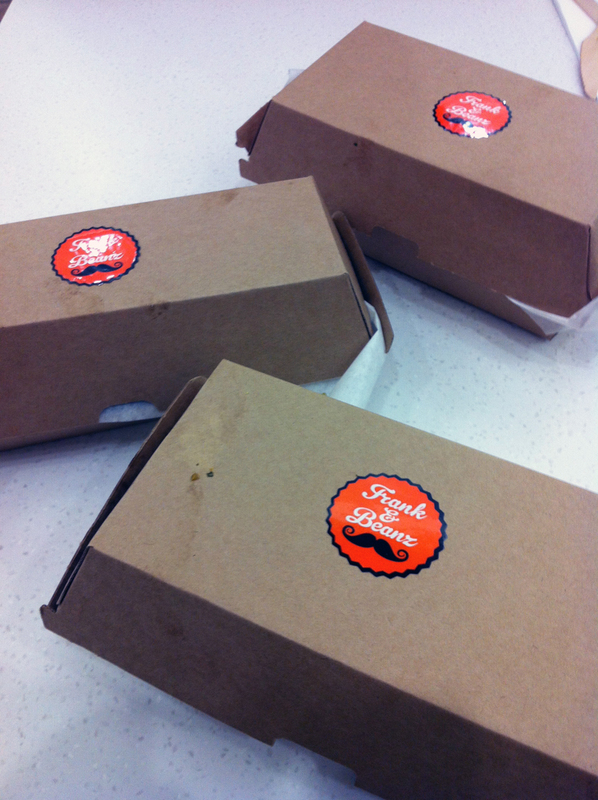 Would Frank & Beanz be a giant food shack or an office cafe? We made the long haul to the city’s outskirts to find out. Until this journey, we had never been to outer space, but to be absolutely frank (mind the pun), Majura Park Shopping Centre is not of this world. It’s no bigger than Cooleman Court, but its remoteness combined with the hospital-style lighting and sterility removes any natural feel. 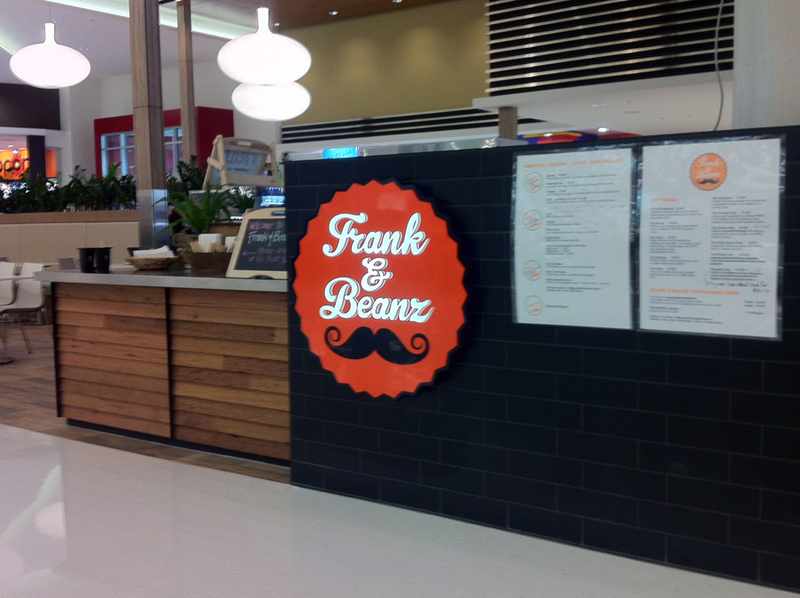 We found Frank & Beanz nestled in the small food court along with a Subway, Coffee Club and other individual traders of various cuisines. We neared the counter and looked for a menu. Their website – to which we’d first been pointed – gave the impression of a well-oiled operation, ready for the expansion promised by the opening of their ‘first store’. In fact, the menu proved difficult to find, let alone read, and was decidedly different to that advertised online. This is not particularly unusual for hospitality venues, but it is odd for a place so new. Even in its revised setting, some options had been crossed out or changed with texta. 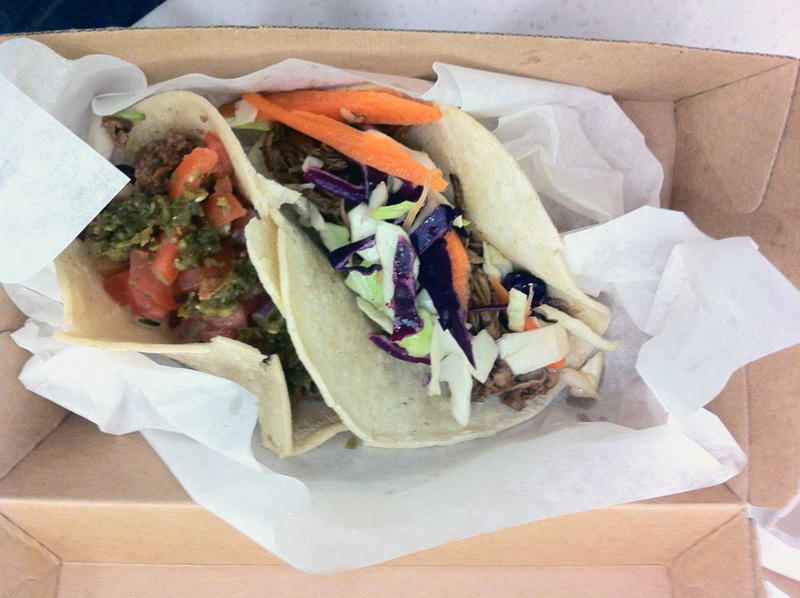 The girl behind the counter hesitated, “Um… I’m afraid they have to be three of the same taco.” We were taken aback. Right. Good idea. Let’s try again. “Okay, can I get two tacos. One beef and one pork. Also I’ll take a ‘Frank’ hotdog.” It looked like a winning weiner. “What toppings would you like?” Oh, God. This was getting too difficult. We won’t put you through the rest of the conversation, suffice to say we left the counter slightly confused as to what had finally been ordered and, despite checking, holding more change than we probably should. We took our little buzzer, familiar to those who have ever ordered pub food, and retreated to a utilitarian white table and chairs. The tacos came in at $4.00 each. 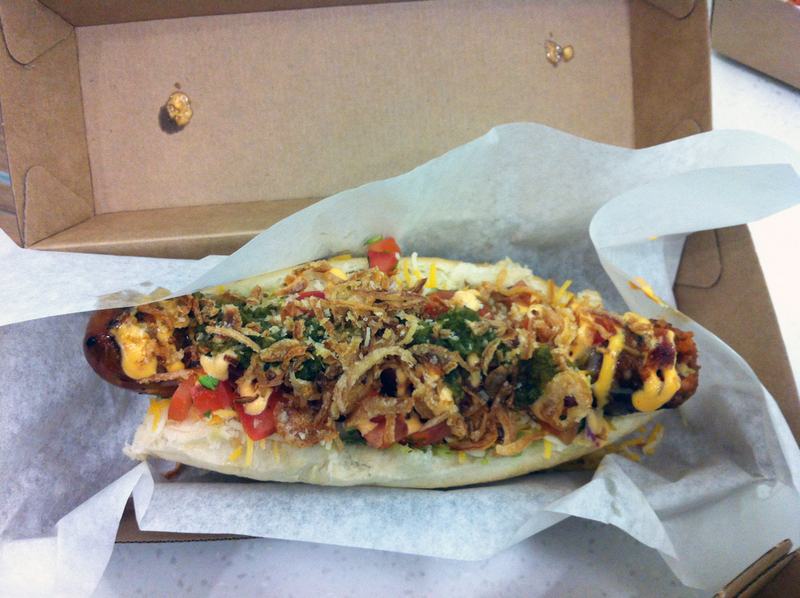 The ‘Frank’ hotdog with grilled chorizo sausage, red pepper mayo, Frank & Beanz’s tomato sugo, guacamole and cheese came in at $8.90. Minutes later we collected our cardboard boxes and readied ourselves for our feast. Apparently ‘frank and beans’ is a euphamism for what may be display should a man’s pants be too tight, however upon opening the taco container, the contents looked like something you might see if your abuela sat down with a mal-adjusted skirt. * To say we were underwhelmed would be an understatement. The tacos looked rather limp and under-filled, lacking any sense of weight or substance. Still, the proof would be in the tasting and, starving, it was time to dig in. First cab off the rank was the pulled-pork taco with apple coleslaw. Two bites and halfway through the taco there was no sign of apple flavour, neither in the ‘appleslaw’ or the cider braised pork. At this stage the cardboard packaging was looking tempting. We soldiered on and moved on to the beef taco. This time we had a better experience. The beef was moist with a decent serve of chilli, the jalapeno sauce on the top set the tastebuds tingling. 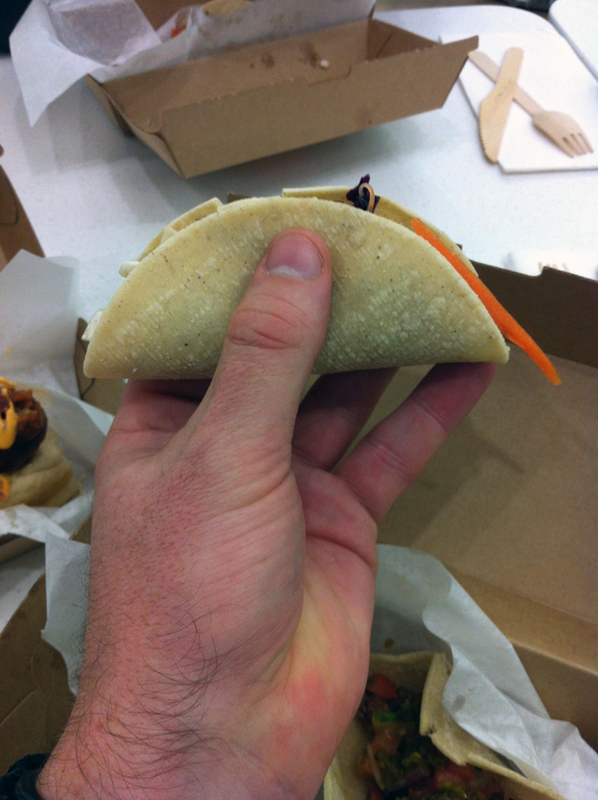 Unfortunately due to the diminutive size of the taco, the tasting was over shortly after it began. We looked at each other and shrugged, aware the ‘Frank’ was ready and waiting. Cutting it in half with the wooden cutlery, we examined our shares before digging in. The first thing that struck us was that this hotdog was light years ahead of the tacos. For starters, the chorizo sausage was a revelation, so juicy and spicy and holding the hotdog together, both structurally and from a flavour point. The red pepper mayo was truly delicious, and the sweetness of the fried brown onion contrasted the sharpness of the diced red onions. There was more flavour and spice and crunch than we could (and would) have hoped for. This was the quality of food we had travelled all this way, at a shade under nine bucks provides substantially more value than the wimpy tacos. What a shame Frank and Beanz can’t keep this standard across their entire product line. These days, one doesn’t have to look too far to see how good the humble taco can be. On the taco side what a disappointment, we love Mexican and are new to Canberra so trying to find a place we love. (apart from the bus depot markets Mexican which I’d great, chimichanga is awesome). Hotdog sounds great, should be with the competition of the cheap Costco hotdog next door. I’m glad I’m not the only one that found it disappointing as well, The hotdog was Ok. Thank you for letting me know about the three tacos for $10 I know I would not get that I may give it a second try and go for the THE WIENER MIX.